The Bunyip community lost one of its true legends recently with the passing of 98-year-old Clarence ‘Clarrie’ Steenholdt. His story began in the old private Bunyip Hospital on 4 January 1921, soon after the First World War. Born to parents Roy and Emma, he was the eldest of three boys (Clarrie, Ray, and Darcy) and went to the Bunyip State School down the road. But, according to Reverend Jim Connelly’s eulogy, his schooling was rudely interrupted in 1929 when the school was totally destroyed by fire. It was later found that children had, in fact, started the blaze – but Clarrie was to be excused, given he was only eight-years-old at the time! He soon started attending classes in the church hall, but ultimately left school behind to work with his father, growing potatoes and milking out on the swamp. He married Marge Edwards when he was only 19, and share-farmed for Kelvin Anderson – a figure who would become pivotal in his life. Times were tough, and with a young family to support Clarrie took on several jobs simultaneously. That was symbolic of his work ethic, and his drive to provide for his family. He would later go on to rend land at Iona with his father, again growing potatoes; hang skins at the slaughterhouse; deliver bread for Jack Atkinson at the Bunyip Bakery; and work with Wally Toy at the butcher’s shop – all at a time where he played cricket and football for Bunyip. In 2012, leading into what would become the first of two straight Bunyip versus Garfield EDFL football grand finals, Clarrie spoke of the famed rivalry between the two clubs. As he looked over the Gazette’s 2003 coverage of the 1939 grand final through the eyes of Garfield legend Jack Smith, he spoke of how he was never going to play in the clash. Clarrie would go on to become a Bunyip icon, but in 1939 the young winger was brought in as the 19th man for the contest made famous by the Garfield team not turning up due to a misunderstanding about the match being postponed. He quite literally had to get his behind in gear to reach the Nar Nar Goon ground on time. “I was working out at Labertouche and got the message through the milk carter that I was required to come down and play,” said Clarrie, who was 92 in 2012. 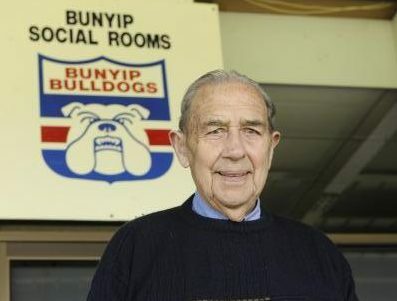 He had a motorbike and sidecar as a 17 and 18-year-old, and had to pick up two of the Bulldogs’ best players – Don Laurie and Percy Wade – on the way to the game because they had no other way of getting to the ground. One hopped in the sidecar, and the other on the back. The 1939 decider, itself, was a game that stopped two towns in their tracks. With the two towns just a couple of kilometres apart, the rivalry was thicker than Collingwood and Carlton at its most fierce. Yet Clarrie said the controversy didn’t affect the friendships between the players on either side – it just strained relations between the opposition teams. Six years later, in 1945, he was part of the Bunyip premiership team. He retired after the 1952 season, but his involvement in sport continued – training a host of winning racehorses. He won a host of Drouin Picnic Cups – including three with champion galloper Elleston. In fact, his biggest interest outside work and his family was indeed his involvement in owning and training horses. He ran them on vacant land next to his house in Mary Street, and would also train them on other properties – including in Bunyip North. And he had plenty of success outside of the nearby Drouin track, as well. His horse, Drumshambo, won the Traralgon Cup and also ran an impressive second in both the Pakenham Cup and the Mornington Cup; while Art Ray won in Melbourne. He also raced his horses as far and wide as Canberra, with one newspaper account referring to him as “the Bart Cummings of Gippsland”. He would later go on to become a committee member of the Drouin Picnic Racing Club, and also serve as course curator which involved a lot of volunteer hours. But, above all else, Clarrie was a brilliant family man. With six children – Kevin, Ray, Trevor, Leigh, Royce and Debbie – he was always keeping a keen eye on their schooling, and their sporting careers. He was no different with his grandchildren, either. Leigh told the Gazette he could remember helping his father with the horses, and heading along to Pakenham, where Clarrie had trained a number of winners – both professional, and on the picnic circuit. He was regarded as a deep thinker who’d give sound advice. Even as a youngster, others would listen intently to him and he had a kind of inner certainty that enabled him to make strong and sensible choices. He lived in Colman Street in Warragul for a long period of time, and was driving right up until he was 95 – showing how active he was, physically and mentally, well into his later life. 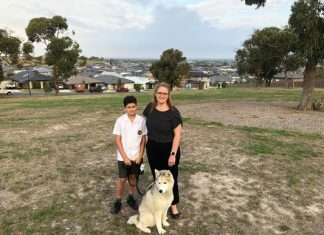 He eventually moved to Pakenham to be closer to his family, and finally moved into McGregor Gardens about four years ago. He continued to have a profound impact as the patriarchal figure in a by then-very large family, and played a particularly pivotal role in the life of Barbara, the daughter of Ray who died young. 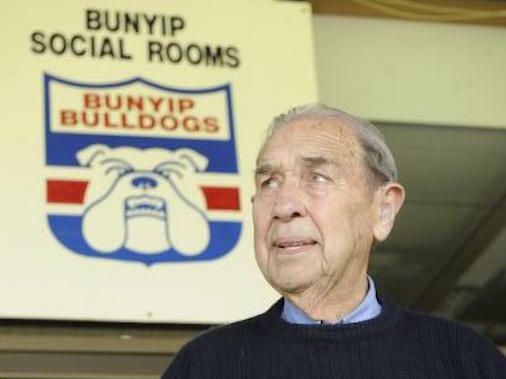 The Bunyip colours were draped over his coffin recently, with the 1945 premiership pennant sitting close-by. But he was synonymous throughout both Bunyip and Garfield – forming a legacy from lasting relationships in both towns. Clarrie was known for his soundness of mind and great memory right up until his last days – showcasing his great knowledge of the local district. He leaves behind a real sense of emptiness in the lives of those close to him.